Ray Bruce - Mowbray & Son, Inc. In 1979, Ray Bruce attended North Dakota State College of Science in Wahpeton, ND and majored in plumbing. After attending for one year, Ray left school and worked various construction jobs. In 1984, he decided to follow in his father’s footsteps and joined the sheet metal trade. Ray became a member of the Sheet Metal Union in 1986 and worked for various companies in ND, SD, MN, WI, and briefly in Las Vegas, NV. Since 1993, Ray has worked on and off for M & S Sheet Metal Inc. In the early 2000’s, he became a permanent Journeyman Field Employee and worked on various projects at the Minot Air Force Base and around the Minot area. In 2010, Ray left his field position and moved into a full-time position in the sheet metal shop. 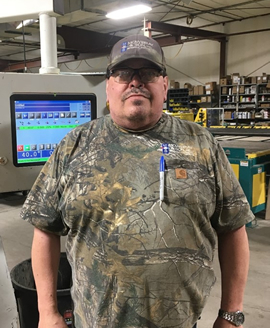 Ray not only works on the custom sheet metal fabrication for large contract projects, but also works on smaller projects for various customers.